The EKI-2706 series supports 48VDC redundant power input and is secured with a double protection mechanism: Power Polarity Reverse Protect and an Overload Current Fuse. 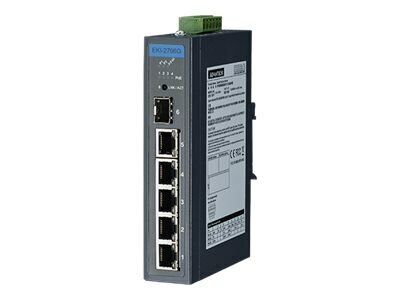 The EKI-2706 series supports up to 4-port IEEE 802.3 af/at PoE /PoE ports, it is more convenient for users to power up their devices. Each port of EKI-2706 has 2 LED's to show the link status transmission speed and collision status. It also provides a relay output for an event alarm. In the event of a power failure, the built-in LED will activate the alarm to notify administrators. Engineers can simply verify the hardware status by checking the LED, and have troubleshooting easy and quick. EKI-2706 comes with compact metal housing that rates IP30 to help against from dusty industrial environments.